Lloyd Sadloo, who was found with drugs following a car chase by police late last year, was yesterday sentenced to four years in jail after a city court found him guilty of the possession of 1.5kg of cannabis for trafficking. His sentencing came within half hour of his request that Magistrate Judy Latchman delay his ruling after the 50th Jubilee celebrations so he could enjoy the festivities with his family. Sadloo, 34, was charged along with Howard Rambharose in October, 2015 after 1.452kg of cannabis was discovered in a car the two were traveling in, following a chase by police and MMC security who were on patrol at the time. The charge, denied by the two, stated that they had the quantity of narcotics in their possession on October 20th, 2015, at Eccles, East Bank Demerara. 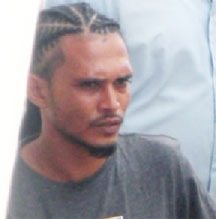 Before the ruling was delivered, Sadloo stated that although he knew the court had accepted the evidence of the police witnesses, he thought the trial was unfair and pointed out that the charge against the driver of the car had been dismissed and the matter pursued against him, the passenger. The drugs, he added, were found in the car and never in his possession. In ruling, Latchman stated that she chose to rely on the evidence of the police witnesses, who she believed had given credible testimony. They had testified that a black plastic bag containing the narcotics were found between Sadloo’s feet, in the passenger side of the car. It was also stated that the defendant had told one of the officers that the bag contained three pounds of weed he had just bought. Latchman said she was assured Sadloo knew of the existence of the narcotics and had been in control and possession, and furthermore, given the weight of the substance, believed he intended it for trafficking, and found him guilty of the offence. Having considered the quantity of the drugs, the prevalence of the crime and the need to prevent others from committing similar offences, the magistrate sentenced him to four years in jail and he was fined $30,000. Although the prosecution had no known prior charges or convictions on record for the defendant, he indicated that he had been sentenced to a year in prison for firearm possession in 2010. Sadloo has been brought before the court for several other offences, including armed robbery, attempted murder, malicious wounding and was also charged along with another in 2013 for cannabis possession for trafficking.